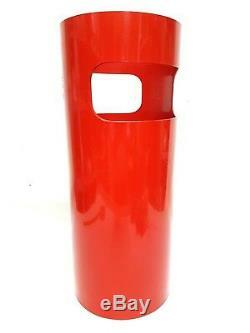 Trash, umbrella stand, model 4610-50, design gino colombini, kartell's original red colour. 60 cm high, 25 cm diameter, very good storage conditions, as shown in photos.. For over ten years we take care of your home, with objects and furnishings with a unique flavor, one of the fabulous 70 years, an era that has left an indelible mark in the history of world design. The objects that we propose are the result of continuous research, often difficult and desperate, and this makes our work a special mission that we carry out daily with great sacrifice and so much satisfaction. Stay tuned, we'll see some beautiful. For over ten years we take care of your home, with objects and furnishings with a unique flavor, that of the fabulous 70s, an era that has left an indelible mark in the history of world design. The objects we propose are the synthesis of a continuous research, often difficult and difficult, and this makes our work a special mission that we carry out daily with great sacrifice and a lot of satisfaction. The objects we offer belong to bygone eras and bring with them, inevitably, signs of their past. Don't be so rigid in your expectations, these signs are part of the charm of something that has already gone through and through you will live on in a new guise. We will always try, by means of our photos, to tell you about the objects in great detail, so that your expectations are always centered. Electrical appliances, where unspecified, always require adjustments to the regulations of the countries in which they are used, often being left in their original configuration. The objects we propose belong to past ages and inevitably bear the signs of their past. So do not be rigid in your expectations, these signs are part of the charm of something that has already lived and through you will continue to live in a new guise. We will always try, through the use of our photos, to tell you the objects in great detail, so that your expectations are always centered. The electrical equipment, where not better specified, always require adjustments to the regulations of the countries in which they will be used, as they are often left in their original configuration. Sales of goods via the Internet are governed by law decree 185 of 22/05/1999 which regulates the matter of distance contracts, i. Carried out outside business premises. This right is reserved exclusively to natural persons, so it cannot be exercised by legal persons and natural persons acting for purposes relating to their professional activity. The only costs are those requests by sending back the product. For any dispute shall be referred to the Tribunal of Taranto. Sales of products via the Internet are governed by the law decree 185 of 22/05/1999 which regulates the subject of distance contracts, that is carried out outside commercial premises. This right is reserved exclusively for natural persons, therefore it can not be exercised by legal persons and by natural persons acting for purposes related to their professional activity. The only expenses required are those for resending the product. 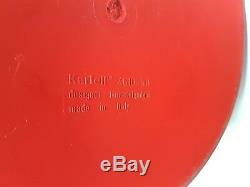 , damage to the product for reasons other than transport. For any eventual disputes the Court of Taranto will have jurisdiction. H3 > Feedback and Starlets. Forbidden to copy, use and unauthorized resale of any material presented here. 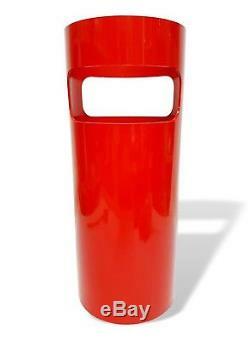 The item "Trash can umbrella holder kartell model 4610 -50 design gino colombini vintage" is in sale since Sunday, January 13, 2019. This item is in the category "Antiques\Other Antiques". The seller is "sullorlodellomicidio" and is located in taranto 74123. This item can be shipped worldwide.